It's Kitchen Sink Stamps Challenge Day - this month's challenge hostess is Lynn. Her challenge is to take some previously used non-stamping item that is headed for the trash can and turn it into a component in your Kitchen Sink project either as a layer or embellishment of some sort! Trash to Treasure so to speak! For my challenge piece I used a box that my friend Robin had send me a few months ago. She said her daughter had received some kind of makeup in the box, and thought it would be something I'd like to alter. I thought the box would be perfect to collect shells and whatnot at the beach. 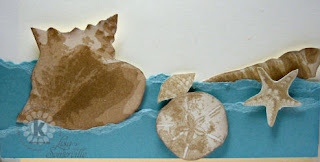 I ripped and sponged some Baja Breeze card stock from Stampin' Up!, to resemble water, then used the Kitchen Sink Stamps 3 Step Sea Shells to stamp images to add to the panels. All shells are stamped as follows, with the exception of the Conch Shell - Creamy Caramel stamped off, Caramel, Caramel. The Conch was stamped in Blush, Caramel, Caramel, Caramel and Caramel. For details on how to enter the Kitchen Sink Stamps Challenge click here. Grab you KSS stamps and play along - you might just win FREE stamps! Don't forget you can save 10% on all your purchases at Kitchen Sink Stamps when you used discount code LISA10KSS. How fabulous, Lisa!! I know I have thrown a couple of these boxes away in my day!! 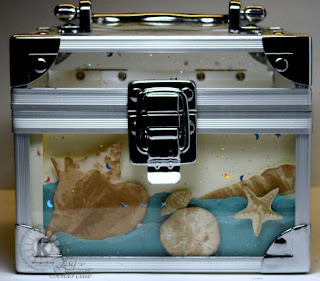 But yours is now a sensational collection box for those treasured beach shells the children cannot resist!! I couldn't resist them either, if I had this wonderful treasure chest to place them in!! So very pretty, Lisa! Love this altered box...such a great box too!! Your seashells are stunning! This box is STINKIN' ADORABLE! I love what you did with it. Such a treasure! !